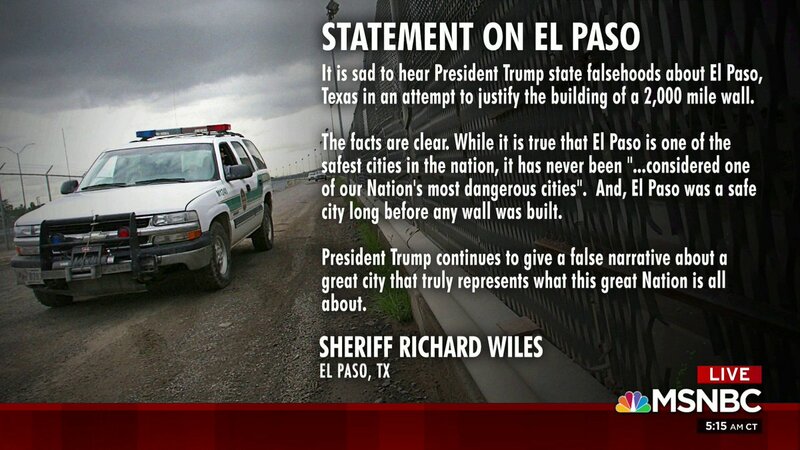 When President Donald Trump was arguing in favor of a U.S./Mexico border wall during his 2019 State of the Union speech, he cited El Paso, Texas as an example of the safety a wall can bring—and according to El Paso County Sheriff Richard Wiles, Trump’s comments were totally misleading. When Trump discussed El Paso’s past, he sounded like he was describing Ciudad Juarez across the border in Northern Mexico. Juarez has suffered from an abundance of violence involving rival drug cartels, but El Paso has long had some of Texas’ lower crime rates. In January, Texas Attorney General Ken Paxton, a Republican, made the same argument that Trump made last night: that enhanced fencing lowered El Paso’s crime rate. But Paxton’s claim was debunked by an El Paso Times article published on January 10. Using FBI and El Paso Police Department statistics for the 1990s and beyond, the Times’ Madlin Mekelburg reported that “between 1993 and 2006, the number of violent crimes fell by more than 34%”—and construction for the El Paso-area border fencing that was authorized under the George W. Bush Administration in 2006 didn’t begin until 2008. In other words, FBI and El Paso Police Department statistics show no correlation whatsoever between El Paso’s decrease in crime and additional border fencing in that area.